Jamie Smith and her teammates carry their season's goals around with them on a printed card. AS one who thrives on competition and challenges, it shouldn't come as a surprise that Iolani girls basketball post player Jamie Smith has gotten particularly excited this year when stepping out well beyond the paint and knocking down a 3-pointer. Though a four-year starter, Smith had never dialed long-distance successfully even once previous to this season. But at 6-feet and as the only true "big" on her Raiders teams this year and last, she got tired of multiple defenders sitting on her lap near the bucket. So, in preparation for her senior season and for college --where she conceded that "6-feet is not a post at all" -- Smith began working out in the summer with former University of Hawaii star Nani Cockett to diversify her skills. The payoff has included several successful makes this season from beyond the arc. "I started working on my outside skills, so that when I actually got into the season I made it one of my personal goals to step out more," said the 17-year-old from Kailua. "And I think that has helped my game a lot -- more than I expected. (At first) I was thinking more for college, yeah I'll step out, but since everybody has been crunching down on me in the post, now I can step out and hit a few shots and it's definitely helped me." Of course Smith remains the dominant force for the top-ranked Raiders down low and one of the top post players in the state. She was second in scoring in the Interscholastic League of Honolulu last year when Iolani won the league championship and ended up being eliminated in the state semifinals by eventual champion Konawaena. Along with the other four Raiders seniors -- who also start -- Smith is the co-captain this year of a hungry group that aims to again win the ILH, but also to best any team that may stand in the way of Iolani winning its first state girls hoops crown in 12 years. And it seems that Smith and these Raiders may have just what it takes. Through the first 17 games, Smith is averaging a double-double of 20 points and 13 rebounds per contest. She had 20 points, 11 rebounds and three blocks on Saturday as then-No. 2 Iolani (14-3, 5-1 ILH) enjoyed a solid team effort in beating then-No. 1 Punahou (6-1) 48-35. The Raiders' lone league loss so far came at the hands of the Buffanblu at the beginning of the month, and the rubber contest looms as their regular-season finale on Jan. 26. "This is my senior year; it's definitely my biggest," said Smith, who along with her teammates, carries a laminated card with her even during school that has ILH and state champs stated on it as specific goals. "This is the most seniors we've had for a while, and having five seniors out there is great because there's a lot of confidence. We're used to coming close (to the state title), and I don't think we want to come close this year." At times during her previous three seasons at Iolani, Smith admitted that she showed frustration with teammates when things weren't going well. Much more than on the stat sheet, this is where this star has grown -- realizing that she needs the other players to feel just as confident in their roles as she does in hers. "Jamie is a real competitor -- she competes at everything she does," coach Glenn Takara said. "She is a really hard worker and really focused on what she wants. That helps push her, and helps push her teammates, to get better. She's our go-to player, but I think she now realizes how important everyone else on the team is." Though expected at Iolani, Smith is just as competitive in the classroom as she is on the court. She began attending the prestigious private school as a freshman, and though Smith didn't care much about her grades before then, she buckled down with the books immediately because she was determined not to lose in the academic game, either. Smith currently maintains about a 3.5 grade-point average, and hopes to pursue forensic science classes in college. She's also determined to continue playing basketball, and currently has a standing offer from coach Jim Bolla and the Wahine with the understanding that, before making a decision, she may still go on official visits with mainland schools such as Utah once her season is done. "I really do pride myself on the school aspect because going to this school is extremely difficult. Everybody (else) sees me as a basketball player, but going home my parents definitely see me as the student because I'm constantly doing my homework," said Smith, whose older brother Scott was a standout in football and basketball at Saint Louis and a freshman football player with Cal-Berkeley last fall. 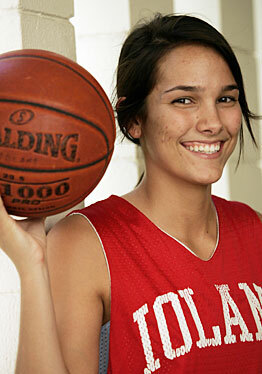 Younger sister Jodi plays basketball at Kalaheo as a ninth-grader. "(But) basketball is a good game, if you go to Iolani, to get out your stress," she added.